The America's Heat Pellet stove by LMF Manufacturing Ltd provides the traditional comfort of a viewable warm fire place, all while burning cleaner and more efficiently than other wood or gas based sources. Utilizing a temperature based feed control system, the stove provides the desired heat to the home, while consuming the smallest amount of fuel possible. The B-100 will warm your home to the desired comfort level, while only consuming as much as 50% less fuel when compared with other pellet stoves on the market. Our virtually silent high torque motor driven auger feed system delivers consistent fuel to the burn pot in near silence. The B-100 meets or exceeds the safety standards set forth by ASTM E1509 certified for USA and Canada by Intertek Warnock Hersey, which also approves it for safe use in mobile homes. 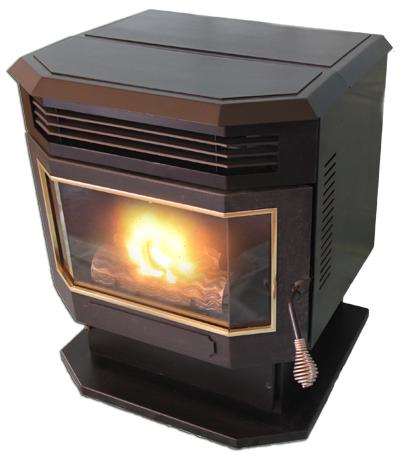 The B100 is also certified to comply with the EPA's 2020 particulate emissions standard making it a certified clean burning wood heater. The Integrated Automatic Ignition System will automatically ignite the wood pellets. No need for fire starters, matches, and or kindling. This means no more mess and foul odors. Burns absolute minimum amount of fuel to bring the home to the desired temperature, will reduce pellet consumption by up to 50%. Thermostat is built into the electronics of the appliance, to operate the stove in thermostat control mode it is not necessary to connect to an external thermostat. Stove can be operated in automatic thermostat control mode or manual mode, giving the homeowner the option of burning the appliance until the selected set point temperature is reached or continuously at one of five selectable feed rates regardless of the room temperature. Automatic unattended temperature based operation. Set point temperature selected via the keypad, stove ignites itself, adjusts the feed rate, combustion blower and circulation blower speeds based on the difference between the desired room temperature and the current room temperature. Stove can be burned continuously at one of five selectable feed rates. Automatic Igniter Integrated automatic ignition system fires the stove when there is a demand for heat. Base feed rate can be adjusted to match the heating requirements of your home reducing temperature fluctuations within the home and allowing the stove to operate at higher efficiencies. High-torque motor driven auger feed system delivers consistent fuel to the fire in near silence. Airtight fuel transport system leads to far higher burn chamber temperatures. Higher burn chamber temperatures result in greater heat transfer from the burn chamber to the home while burning less fuel. Once stove warms the home to the selected set point temperature it shuts itself down but continues to monitor the temperature to detect the next call for heat, at which point it automatically ignites. Continuously moving, self cleaning grate eliminates ash buildup and clinker formation on the grate resulting in a more efficient burn and allows for multiple day unattended burning. Artificial log set positioned over the burn pot such that flames thread through the logs provides the ambience of a real log fire. Top and bottom air wash system keeps the door glass clean longer for a clear view of the fire. Variable speed, high output (265 CFM) circulation blower pushes more air through the heat exchanger tubes at extremely low noise levels. Large capacity ash pan required cleaning only once every one and a half tons of pellets. Hopper Capacity, Std: 50 lbs. Hopper Capacity, Ext: 90 lbs.